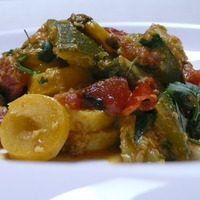 Home » Recipes » Squash In A Spice Paste Done Pronto! This has been one hell of a week, one of those 7 day stretches that includes everything on lifes' smorgey...except dental. Of course the week's not over yet. It's been a week of some nerves, some loss, some traveling, some stress and the general sense of just being unable to catch up. That said, I can't wait for Monday to start the week fresh. Scratch that, I'll take August or better yet 2011. Of course that puts us closer to 2012 and the end of the Mayan Calendar...you see how my mind has been working? This afternoon I was pooped after the weeks adventures and looking for comfort food. We're in the middle of a script and I wanted to fix something that would be tasty, easy and make the best of the fresh produce I snagged at Oak Hill Farm's Red Barn Store. I consider myself insanely lucky to live just a couple of clicks down the road from this place. I'm always knocked out by what I find there. This week it was beautiful squashes, Globe and Baby Crookneck. We started working this morning and the next time I looked at the clock it was 12:30 and I hadn't even thought about lunch! So there I was looking for something I could cook and get on the table in the next 30 minutes. Game on! I decided to combine the squash in a simple spice paste and add in a couple of gorgeous tomatoes that had caught my eye. So here's what to do when work runs late and you forget to cook, and then you remember. Squash In A Spice Paste Done Pronto. First of all cut about 1 lb of mixed Globe and Baby Crookneck squash into pieces. Cut the Globe Squash into cubes and the Crookneck into slices. Set them aside. Blend it all into a paste. In a deep skillet or kadhai heat 2 Tbs of unsalted butter. When the butter is hot, toss in the spice paste. Stir it around a bit. When it thickens, add in 2 tomatoes seeded and chopped. Stir them around for a few minutes. Give it a stir then "put a lid on it" and let it do its' thing for about 20 minutes. Give it a check once in a while and make sure nothing is sticking. When the squash has cooked through, add in another 1 and 1/2 Tbs of cilantro and eat up. We had lunch on the table in no time and Alan, the eternal carnivore remarked that he could eat just this, he loved it so much. That's the way a good vegetarian dish should work. Protein amnesia. I served this squash with a piece of grilled chicken this afternoon but for a complete vegetarian meal, just some rice or dal and a raita and you're in business. It was a delicious way to slide into the end of the work week. I know next week will be better. It almost has to be, and one thing that will help will be finding some padron peppers at the Organic Farmers Market tomorrow. That will be a big improvement. Quick And Creamy, Super Dreamy, Cauliflower Curry! Ebony And Ivory, Black Bean and White Corn Salad.